After a massive meticulous renovation of his 1668 home, Jeffrey took to the task of making it his own. 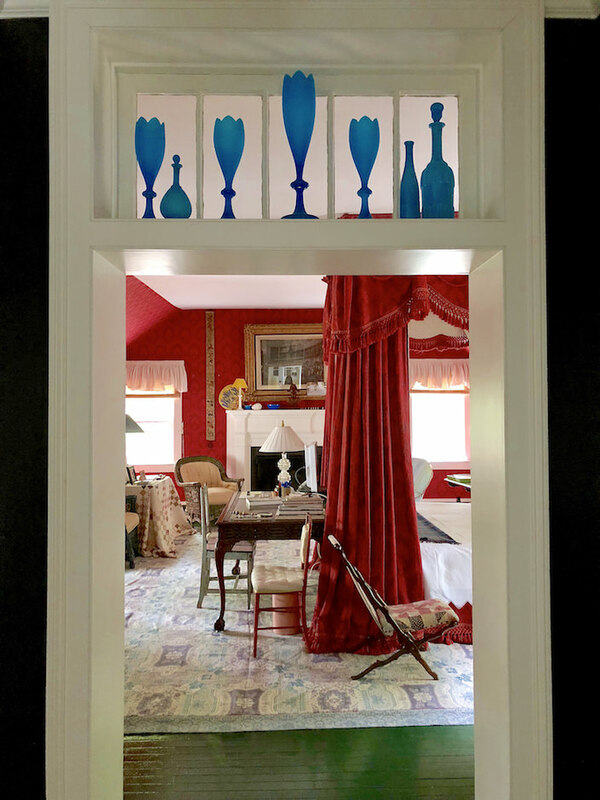 Calling on his vast knowledge of design history, he references everything from the homes of Jefferson and Washington to Colonial Revival, all with a robust irreverence that permeates the house with an optimistic attitude. Jeffrey may be one of our great American designers, but he knows the value of infusing a hearty sense of humor into a distinguished decor. 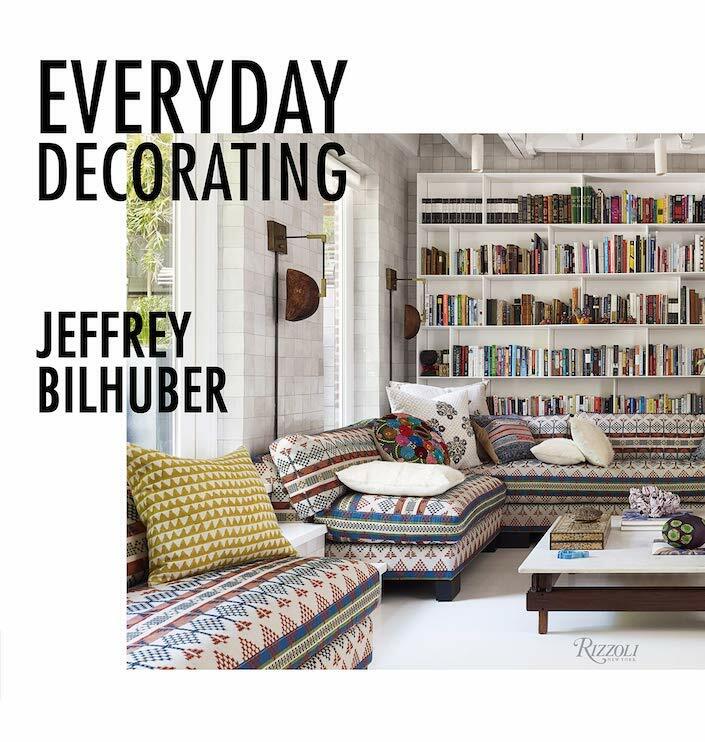 An intrepid use of color has always been one of Jeffrey’s signatures and at Hay Fever he has bathed every room with saturated hues that serve as heroic backdrops for a fearless panoply of pattern, bold shapes without forgoing comfort and practicality. These same qualities can be seen in his many product and licensing collaborations including his recent collections for de Gournay and The Lacquer Company. In Jeffrey’s skilled hands, traditionalism takes on a new meaning – a fearless approach that is anchored to a sense of place and time yet emphatically of today. So thank you Jeffrey – we are delighted to share a visit with you at your stunning country home. This entry posted in architecture, art, At Home with, books, interior design, Quintessence video series. 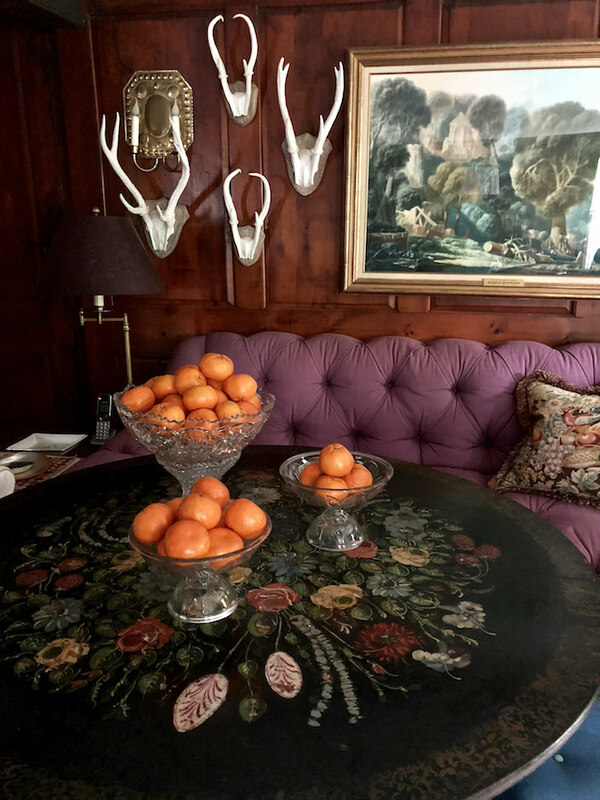 Entry Tags: At Home with, Decorating, everyday decorating, historic house, interior design, Jeffrey Bilhuber, Locust Valley, Video, video series Bookmark the permalink. Thank you for todays story! I have been watching for your visit with Hayfever for months! Great American perfection, I’m crazy for every fabric, every corner, every wink. Thank you for this informative and beautiful tour Stacey and Susanna and to Jeffrey Bilhuber for inviting us in. Susanna and Jeffrey ! Chic ! Jeffrey so wonderful to make jokes about the trinket shop. Every corner of his home fills your eye with pleasure. And Susanna looks more beautiful than ever. That jacket is gorgeous. We need a tour of Susanna’s closet. Only a great eye puts that jacket together with those pants. 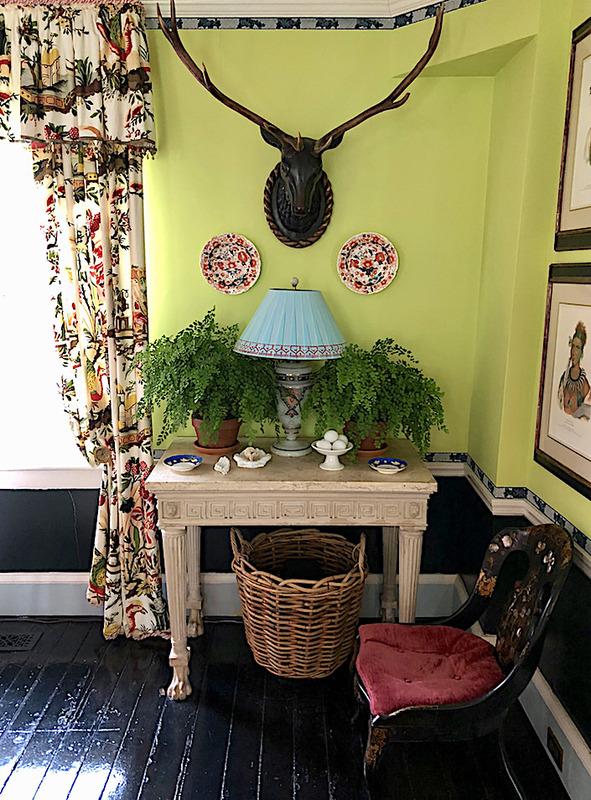 Jeffrey’s brief about the great American house makes me long for it- the countryside, the handmade lampshade, the bright colors, the relaxed attitude and the acknowledgement of our great American founders. Absolutely love every inch! It just makes me happy. Thank you so much for sharing and brightening my day. Again, so well done. I am so grateful to you Stacey and Susanna and crew. These posts and videos inspire me tremendously. It also serves a much needed niche, I believe, which was left barren when publishers could no longer produce high quality magazines at affordable prices, and HGTV took an entirely downward turn toward the makeover format. There is an entire generation of us out here who LOVED the beginning days of HGTV when PROFESSIONAL designers took us on tours of inspiring homes and gardens. Now in my sixties, I have renovated several homes. I know how to do almost anything necessary: tile, drywall, roofing, laying floors and refinishing woodwork, etc…and, I DON’T WANT TO DO IT MYSELF. I am not going to subscribe to a television channel (or even tune in) to listen to the sound of power tools and watch the grueling process. Been there, done that, thanks anyway. INSPIRE ME! I CRAVE BEAUTY! 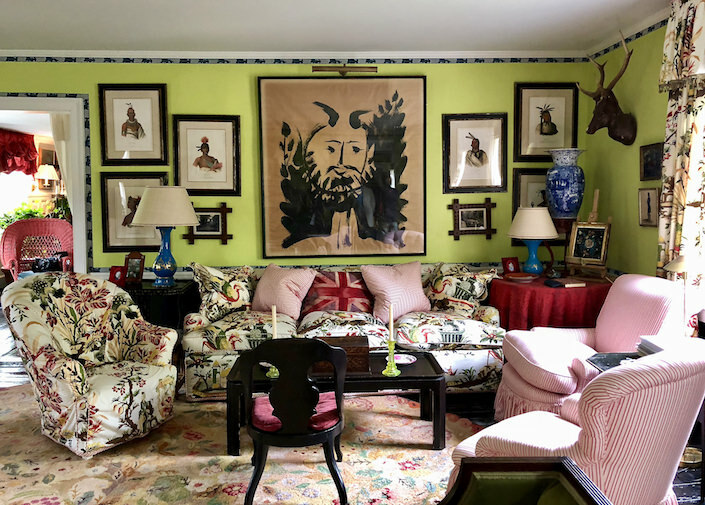 Love Jeffrey’s home, its colorfulness, sense of history combined with humor. All characteristic of the designs Jeffrey does for his clients and such a relief from the trendy and homogeneous modernism prevalent today. 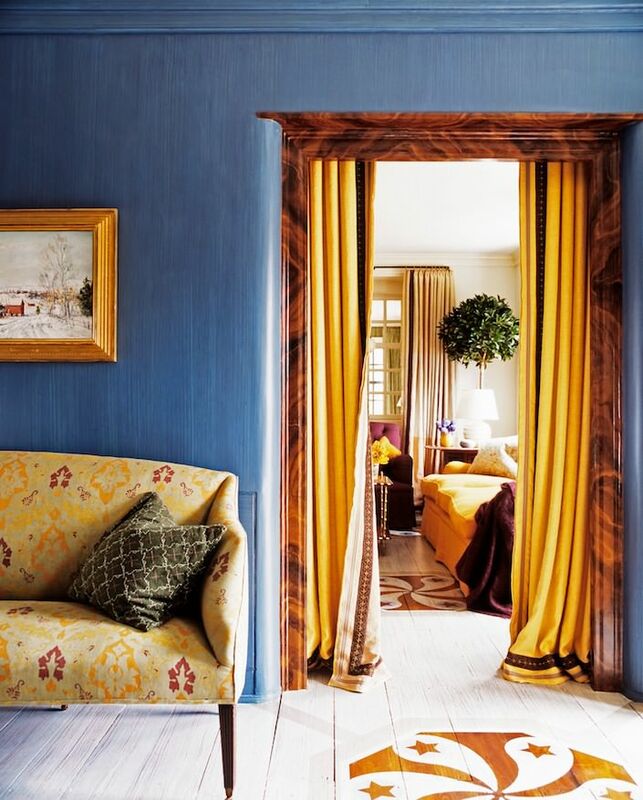 I especially love the unexpected color combinations and Fabrics and wallpapers. Jeffrey’s son is adorable, a poised, handsome and charming young man. Thanks for this! 84 queries in 2.150 seconds.